Since its inception in 1997, The Chapel Hill Breast Cancer Foundation has donated more than $765,000 in support of breast cancer research at Duke, UNC and Wake Forest Universities. 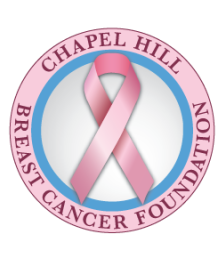 The Chapel Hill Breast Cancer Foundation (CHBCF) is a 501(c)(3) nonprofit organization with the singular mission of supporting discovery-phase breast cancer research projects at our local universities. Despite tremendous success in both detection and treatment, breast cancer still claims the lives of more than 100 women every day in the US alone. New and novel approaches to prevention, detection and treatment are desperately needed if we ever hope to unravel the complex interactions of the many risk factors and truly cure breast cancer. The CHBCF differs from other charities in that 100% of the money raised goes directly to the research institutions. This is made possible through the generosity of our dedicated volunteers, sponsors, supporters and event participants. Along with other donations to the foundation we raised a total of $65,218.20 in 2018. These funds were distributed equally -- $21,739.40 each -- to the breast cancer research programs at Duke University, University of North Carolina and Wake Forest University. Your past donations are making a difference today. Today's donations will make a difference tomorrow. Help spread the word about our efforts to fund breast cancer research in North Carolina by liking us on Facebook, and telling your friends!